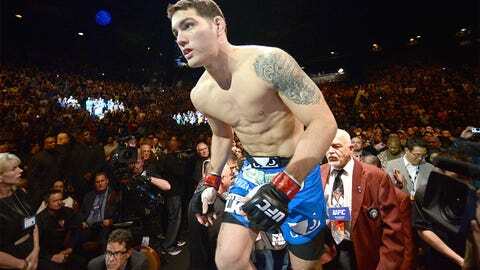 Chris Weidman is looking for a little time off before taking on Vitor Belfort. Even before Chris Weidman stepped foot into the Octagon at UFC 168, he knew what was on the other side if he emerged with the belt in tow. And when he did, Vitor Belfort was waiting for him, quite literally, at the post-fight press conference. The two will match up sometime in 2014 with the middleweight championship on the line. The question is when. While Weidman suffered no damage in his second-round TKO win over Anderson Silva on Saturday night, he didn’t escape camp without some issue. Weidman told FOX Sports that he couldn’t give a timeframe for the Belfort fight before assessing his health, but might want to take one or two months off. I can’t even think about that [Belfort fight] right now. I’ve got a couple of dings I’d like to rest up and get looked at. Weidman’s Brazilian jiu-jitsu coach, the former UFC welterweight champion Matt Serra, told FOX Sports that Weidman would probably need to rest or address a knee injury that became a mild annoyance during camp. The injury is not believed to be serious but may require a scope to clean it out. Even if it was not necessary, Weidman’s head trainer Ray Longo said he would prefer to see Weidman take some time off after going through two challenging fights along with all of the hoopla that came with his July title win and ending Silva’s historic run. Right now, Belfort may be the heaviest hitter of them after becoming the first man in UFC history to record three straight head-kick knockouts. He’s been on fire lately, but I think Chris has the techniques to shut him down and take him out. Belfort was impressed with the way Weidman dominated the fight and said he was a "great champion," but said that when it comes to Weidman’s belt: "It belongs to me." That’s not how Weidman’s side sees it, believing he has the skills, fight IQ and adaptability to beat anyone in the world. "Vitor possesses different problems than Anderson," Serra said. "He’s been on fire lately, but I think Chris has the techniques to shut him down and take him out."